Known in Bangkok as one of the top restaurants that serves northern Thai jungle curry (gaeng pa แกงป่า), I was really looking forward to eating at Ran Gaeng Pa Sriyan (ร้านแกงป่า ศรีย่าน). Though quite a local restaurant, there’s both a Thai and English menu. However, I did notice that the English menu only contained about half the dishes that were on the Thai menu, the frog and quail both absent on the English menu. So that’s exactly what we ordered: the frog and the quail. 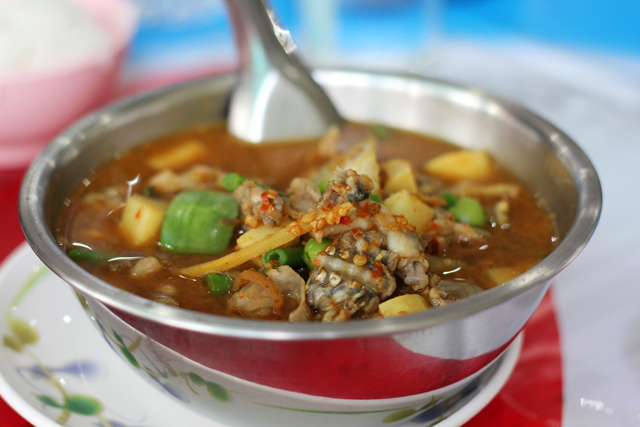 As the name of the restaurant suggests, Thai jungle curry (gaeng pa แกงป่า) is what it’s most famous for. Northern Thai jungle curry is a mindblowingly flavorful medley of vegetables, herbs, chillies, pungent roots, and a choice of meat. Traditionally, the jungle curry was most frequently made with wild boar and a selection of natural growing vegetables from the forest. It’s by far the best Thai jungle curry I’ve had. 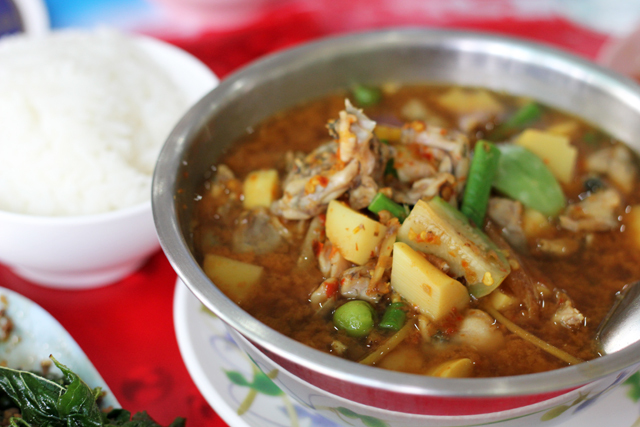 The mixture of young bamboo shoots, Thai eggplant, pea eggplant, fiery chillies, strips of ginger-like krachai (a rhizome similar to ginger but with no real English name), big clumps of simmered basil, and the meaty chunks of frog made it spectacular. It literally contained the earthy yet green flavor of an entire jungle in a bowl before me. It was spicy and amazingly good. 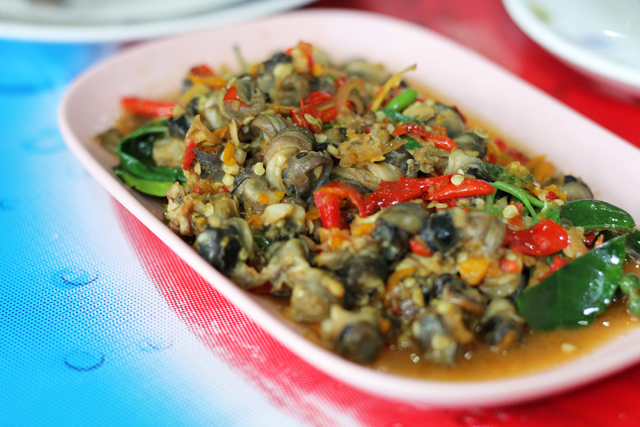 Next up were the bitter river snails stir fried with a generous amount of krachai (Hoy Comb Pad Cha หอยขมผัดฉ่า). The snails were conveniently de-shelled and just slightly rubbery, not a bad thing, I like the texture. Again, the flavor was extremely fresh, including plenty of chili peppers, kaffir lime leaves, fresh green peppercorns, and garlic. 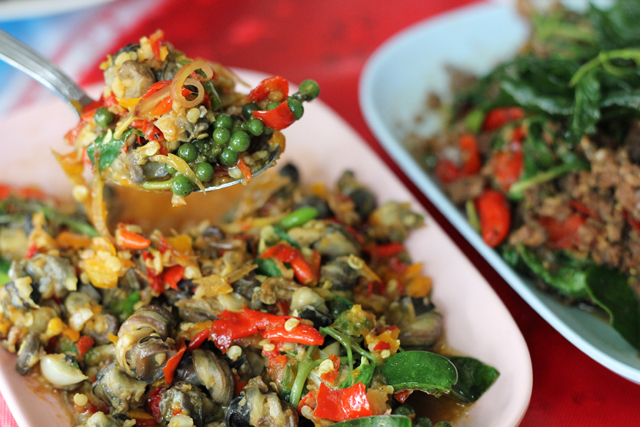 Here’s a colorful bite of the snails (หอยขมผัดฉ่า). I absolutely love Thai green fresh peppercorns. They are mild, not spicy, but every little ball is a bomb of peppery flavor. Every dish we ordered was beyond delicious and prepared to perfection, but out of everything, even more than the Thai jungle curry, I fell in love with the minced quail prepared kee mao (drunken) style (Nok Sab Pad Kee Mao นกสับผัดขี้เมา). The best dish of the meal! The quail was ground up, quite a few bones included, so it was a little crunchy at times, but tasted almost like ground beef. 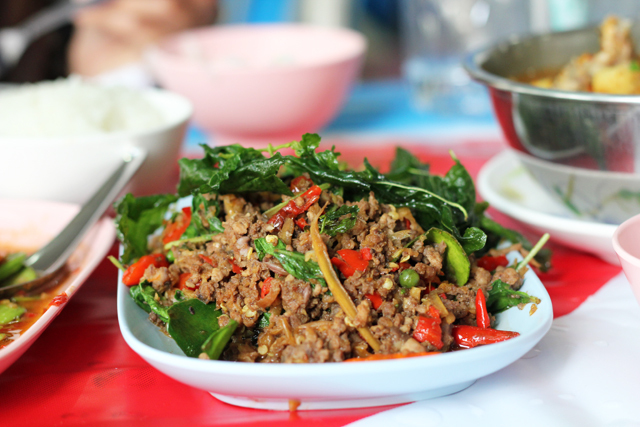 A variety of spices, intense chillies, fried kaffir lime leaves, and dark soy sauce made it extraordinary. My favorite dish of the meal! 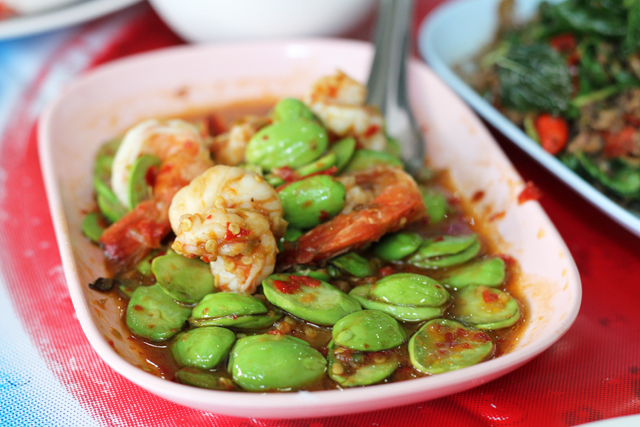 And just for good measure, being a die-hard stink beans fanatic, I simply had to order the Goong Pad Kapi Sataw (กุ้งผัดกะปิสะตอ). The shrimp were big and meaty and the plate included a generous helping of the luscious beans. Another bonus was that it was fried in a combination of chillies and fermented shrimp paste for even more extreme delicious flavor. 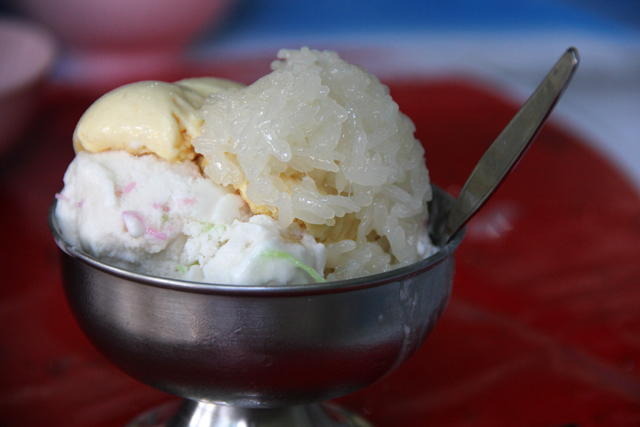 And last but not least, nearly everyone that enjoys a meal at Ran Gaeng Pa Sriyan (ร้านแกงป่า ศรีย่าน), cools down the mouth and eases the stomach with a final course of ice cream topped with sticky rice. The durian ice cream was really good, but if you go just a couple blocks down the street to Ice Cream Sriyan, the durian ice cream is even better. The coconut ice cream was alright here as well, but not the best I’ve had. However, ice cream after spicy jungle curry really hits the spot. The food is astonishingly good, I don’t think they do anything wrong. The jungle curry is amazing, and I’m sure it would be fantastic with whatever choice of meat you choose. The minced quail, my particular favorite, was sensational. I’d add that the flavors are very strong and they use a lot of chillies in their cooking, so this is very much a spicy lover’s restaurant. Check out the full video of this awesome meal! 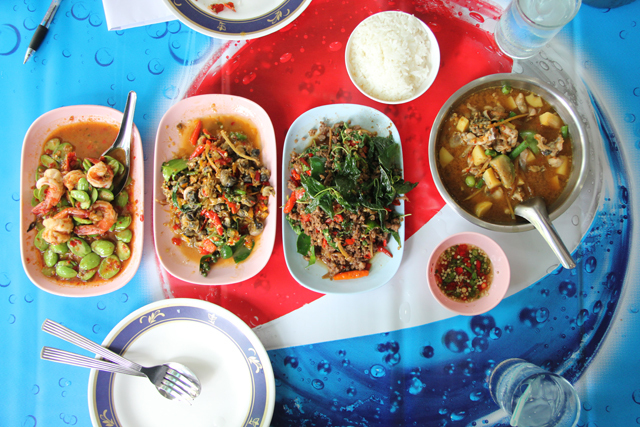 Prices: Dishes are about 60 – 100 THB. Two of us had 4 dishes, 4 bowls of rice, 1 bowl of ice cream, a few bottles of water, and our bill came to just over 500 THB. That being said, we had enough food to probably feed four… we were just really hungry! 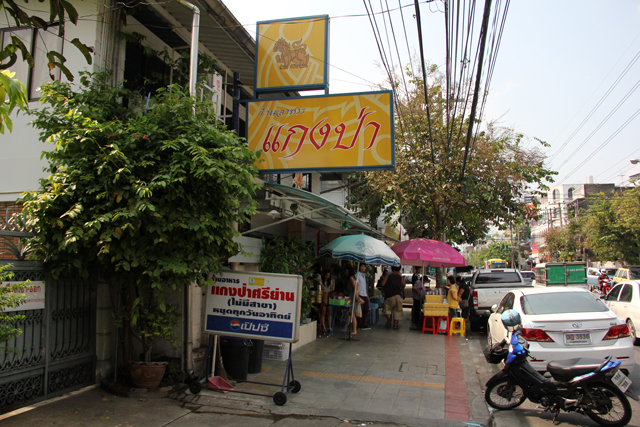 Ran Gaeng Pa Sriyan (ร้านแกงป่า ศรีย่าน) is located just a few blocks from the Sriyan Market. The closest BTS station is Victory Monument and from you’ll either need to take a direct taxi for about 60 THB or take bus #14 from Victory Monument. My bf has been watching your videos for a long while and he is finally heading to bangkok! Just like to check if there are any other exotic food at this place that is not written in the english menu? We love to try and explore unique food! I just had a great lunch at this restaurant. 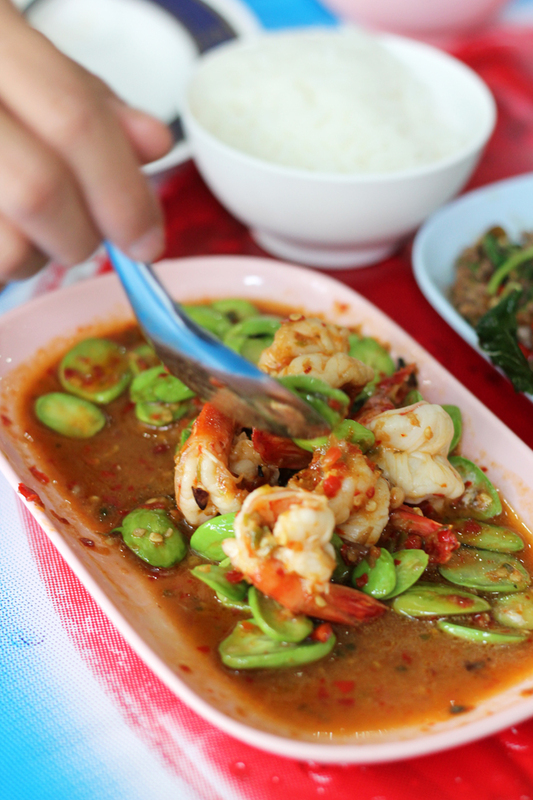 I ordered the Frog Jungle Curry and Nok Sab Pad Kee Mao, both with full spiciness. Your romanizations of the words were spot on. The waitress was impressed that I ordered it in Thai =) They were both superb! It was my first time eating frog, and I don’t know why it took me this long to try it haha. They were crazy spicy but they tasted so good that I refused to stop midway, so I just took my time to eat everything up. It took me 2 and a half hours, but what a meal! Finished off with some durian ice cream to soothe my burning taste buds and red lips. I wanna get used to this level of spiciness so I can enjoy eating food like this better. It might take a while though haha. Next stop, Soei! 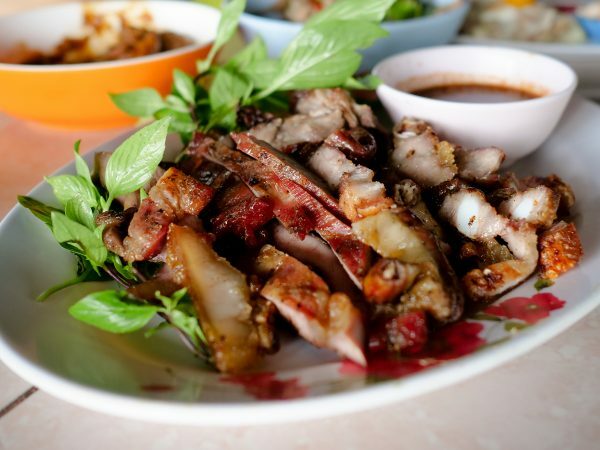 Hey Chris, wow, thank you for sharing about your experience at Gaeng Pa Sriyan, and I’m so happy to hear you loved it and you finished off every last bite. My mouth is watering just thinking about the food there. Oh yes, enjoy Soei, that restaurant is equally stunning! Thank u for all the usefull info… I daw somewhere u did live around DinDaeng for a period… i live now in Ramkhamhaeng area but want to move close to ThaiNippon Stadium, where i can play my favourite squash game :-)… could u advise me where to find a cheap and good condo or such… would be of greast help …. Hey Frank, yes I lived right new Victory Monument for quite a few years. I don’t exactly know where that is, but there are plenty of places around Victory Monument, also Rang Nam. You won’t believe it. I traveled to Bangkok to attend Chulalongkorn for this school year. I booked a guest house for my arrival while I sort out an apartment and, lo and behold, this restaurant is right around the corner! It is Sunday as I type this. Rest assured I will be eating gaeng pa tomorrow! Hey Nick, awesome to hear that, hope you enjoy (or enjoyed) this place! Mark, I like your taste in food bro! After eating at this restaurant I would recommend it for anyone who wants to try delicious Thai food in a local neighborhood setting. I was asked by the owner to tell future visitors to Ran Gaeng Pa Sriyan that all of these dishes can be prepared with your choice of meats or seafood instead frog and quail which I would like to add has a crunchy texture like bones for those who are not used to that might find it a little off putting. An English menu is in the works. Thanks! Hey Long, glad you ate at this restaurant and glad we have a similar taste for food! I love your blog and your recommendations. I just visited this restaurant and it was wonderful! 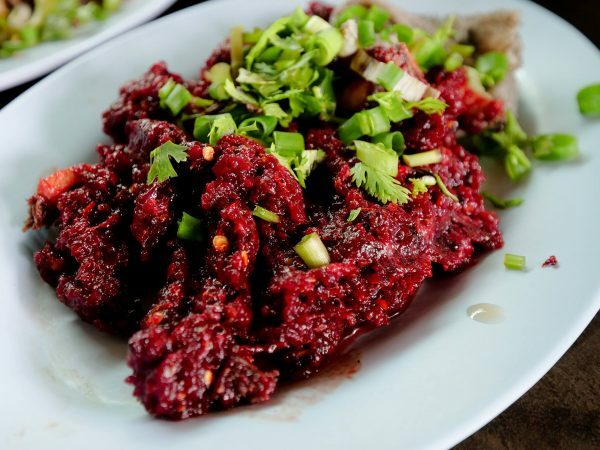 However, you should put a warning regarding the minced quail – it’s really really spicy! Hey Betty, glad you ate here, they serve some amazing food. Yes, it’s spicy! Will you be so kind to tell the prices of meals you ate? Jungle curry, beans, durian ice-cream etc. This place/dishes sounds great. I will try to find it when i go to BKK in 3 weeks. 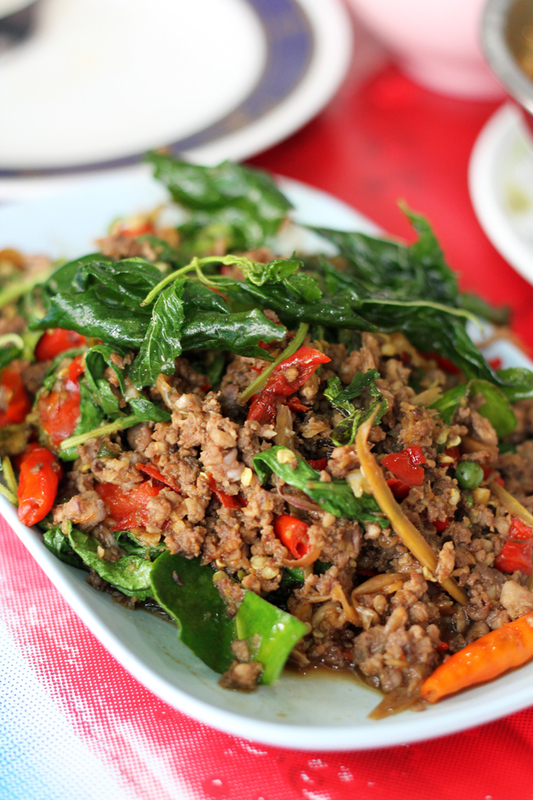 If it’s anyting like Larb Pla [email protected] Larb Ubon, i will be in heaven. Hey, this is an awesome restaurant, you’re going to enjoy it!